Ireland’s Rob Kearney celebrates after the match. 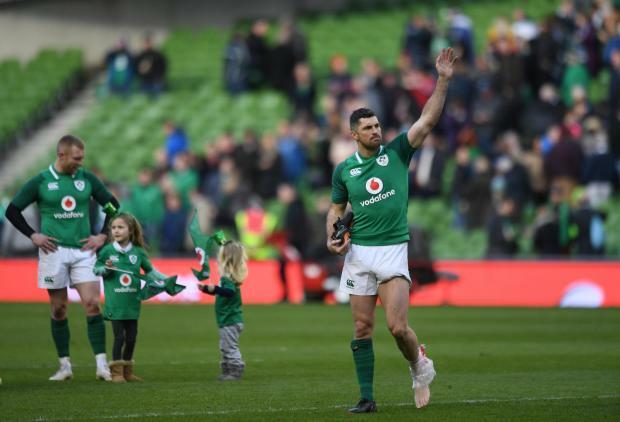 Ireland have wrapped up the Six Nations title with a round to spare but every team goes into "Super Saturday" with plenty to play for, not least the four sides who can still finish second. Below we look nation-by-nation at the Saturday scenarios. Top of the standings with 19 points from four wins, including three bonus points, the title, their first since 2015, is in the bag. Ireland are by no means finished, however, as they travel to Twickenham seeking the victory that would give them a third grand slam after those of 1948 and 2009. Last year it was the opposite scenario with England seeking a clean sweep in Dublin, only to lose for the first time under Eddie Jones. Ireland's players and fans took great delight in the long faces of England's defeated players collecting their championship medals and will not want to experience the same bitter-sweet taste. England have won three of the teams' last four meetings at Twickenham. Second on 11 points after two wins and two defeats, Wales host France in the last of the day's three games knowing a bonus-point victory would guarantee second place. They are one point ahead of England so any win is likely to be enough to achieve that. Their recent home record against the French is good too, with four wins from the last five. England have 10 points from four games after their title defence was derailed by defeats in Scotland and France and another loss on Saturday would be the first time they have been beaten three in a row in the championship since 2006. Should that happen and France and Scotland both win, or even if France suffer a narrow defeat, England, who have not been out of the top two in the last seven years, could finish outright fifth - their worst performance since 1983. However, should England do to Ireland what the Irish did to them, they would not only prevent a grand slam but could haul themselves up to second, depending on the Wales v France result. France's mini-revival has taken them to 10 points and means they travel to Cardiff seeking three successive Six Nations wins for the first time since their grand slam year of 2010. Since 2011 they have finished in the top half of the table only once and victory would guarantee at least that, with second place also a possibility. However, the French have lost four of their last five matches in Cardiff and another setback would leave them staring at another probable fifth-place finish. Scotland have finished in the top three only three times since Italy joined the competition in 2000 but victory in Rome in the first of Saturday's games could get them third place with an outside shot, should they rack up a monster score, at second - which would be their best performance since winning the final version of the Five Nations 19 years ago. Currently on eight points, should they lose in Rome, the Scots would finish fifth. It has not been a happy tournament for Italy, who face ending up pointless for the third season in a row and are already guaranteed last place for the 13th time in 19 attempts. Since the relative high of 2013 when they won two games they have managed only one victory in 24 matches and are currently on a 16-game Six Nations losing streak. On the positive side, seven of their 12 Six Nations victories have come against the Scots.